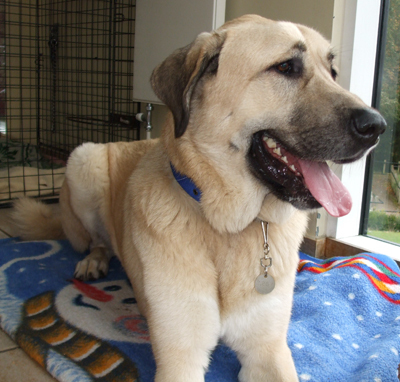 Hugo is a 1-2yr old Anatolian Shepherd dog at Battersea Dogs Home in London. Hugo is larger than life and is looking for experienced owners who have owned giant breeds before. They need to be passionate about dog training so that they can channel his energy and cope with his strength. Hugo has high energy levels and approaches life with enthusiasm and zest, he can be bouncy at times as he is still very young and requires continued guidance to help him mature and settle. He is very responsive and bonds well to his handler making him rewarding to work with. Hugo already knows some very basic commands such as ‘SIT’ and ‘DOWN’ but requires further instruction in other areas of obedience. Hugo enjoys mixing with other dogs and is a fun character who shows high potential if given the time and patience he deserves. Any potential new owner will need to speak to a Battersea vet prior to rehoming Hugo. If you are interested in rehoming Hugo please contact Battersea Dogs & Cats Home on 0843 509 4444 or visit www.battersea.org.uk.